This model runs in COR and OpenCell with no errors. The units have been checked and they are consistent. 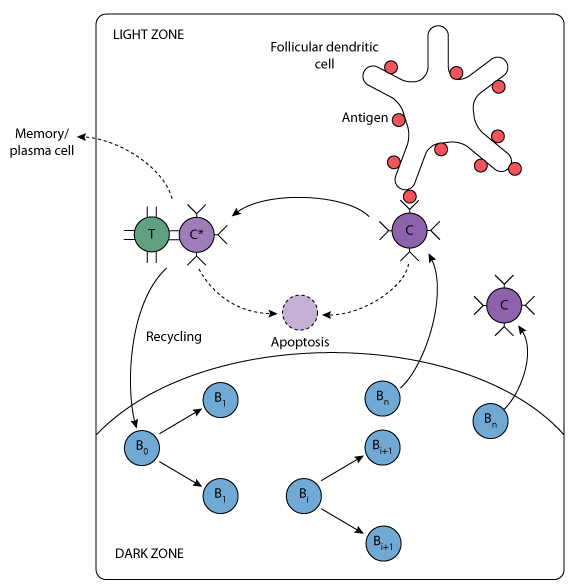 The CellML model can replicate the shapes of the graphs of all of the figures in the paper but the scale does not always match those in the paper. ABSTRACT: We devise a mathematical model to study germinal center (GC) kinetics. Earlier models for GC kinetics are extended by explicitly modeling 1) the cell division history of centroblasts, 2) the Ag uptake by centrocytes, and 3) T cell dynamics. Allowing for T cell kinetics and T-B cell interactions, we study the role of GC T cells in GC kinetics, GC termination, and B cell selection. We find that GC T cells play a major role in GC formation, but that the maintenance of established GC reactions requires very few T cells only. The results therefore suggest that the termination of a GC reaction is largely caused by lack of Ag on the follicular dendritic cells and is hardly influenced by Th cells. Ag consumption by centrocytes is the major factor determining the decay rate of the antigenic stimulus during a GC reaction. Investigating the effect of the Ag dose on GC kinetics, we find that both the total size of the GC and its duration are hardly influenced by the initial amount of Ag. In the model this is due to a buffering effect by competition for limited T cell help and/or competition between proliferating centroblasts. Derived from workspace Kesmir, Deboer, 1999 at changeset 73280bb07c7f.